This work presents a novel approach for robust PCA with total variation regularization for foreground-background separation and denoising on noisy, moving camera video. Our proposed algorithm registers the raw (possibly corrupted) frames of a video and then jointly processes the registered frames to produce a decomposition of the scene into a low-rank background component that captures the static components of the scene, a smooth foreground component that captures the dynamic components of the scene, and a sparse component that isolates corruptions. Unlike existing methods, our proposed algorithm produces a panoramic low-rank component that spans the entire field of view, automatically stitching together corrupted data from partially overlapping scenes. 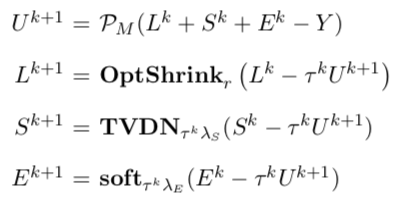 The low-rank portion of our robust PCA model is based on a recently discovered optimal low-rank matrix estimator (OptShrink) that requires no parameter tuning. We demonstrate the performance of our algorithm on both static and moving camera videos corrupted by noise and outliers. Chen Gao*, Brian E. Moore*, Raj Rao Nadakuditi, "Panoramic Robust PCA for Foreground-Background Separation on Noisy, Free-Motion Camera Video", arXiv:1712.06229, 2017. Chen Gao, Brian E. Moore, Raj Rao Nadakuditi, "Augmented Robust PCA For Foreground-Background Separation on Noisy, Moving Camera Video", in IEEE Global Conference on Signal and Information Processing (GlobalSIP), 2017. We thank Jason Lai for providing this wonderful website template.